"Medium Traffic Commercial and Heavy Duty Residential Locks"
- Select Function: Passage, Privacy, or Single Dummy. - Select Finish: Brass (605), Oil Rubbed Bronze (613), or Satin Chrome (626). - Lever Option: Levon (LEV). - Delivery: The Schlage Commercial A-Series Levon Levers are factory-ordered, please allow 3-5 working days' lead time. Medium traffic commercial and heavy duty residential locks. From military barracks and offices, to fine residential homes, Schlage A-Series knobs easily stand up to constant use and abuse, while keeping people and property safe. Our A-Series locks have an ANSI Grade 2 rating and come in a choice of styles and finishes that fit your building's design. We don't compromise on security. - Cold rolled steel, and machined and threaded hubs prevent loosening of the lockset by bolting the chassis to the door. - Heavy-duty cast mounting plate with specially tapped holes keeps lockset tight on the door. - Patented door range adjuster allows quick and easy adjustment for doors ranging from 1-3/8" to 1-7/8" (35mm to 48mm) thick. The Schlage Commercial A-Series Levon Levers are reversible. In compliance with the American National Standard Institute (ANSI A117.1) and the Americans with Disabilites Act (ADA), Schlage Lock Company offers a wide selection of locks designed for the needs of the physically challenged. This act is designed to provide protection for people with disabilites. Function: The Schlage A-Series Levers are available in Passage (A10S), Privacy (A40S), and Single Dummy (A170) function. Finish: The Schlage A-Series Levers come in Brass (605), Oil Rubbed Bronze (613), and Satin Chrome (626) finish. Lever Design: The Schlage A-Series Levers come in Levon (LEV) design. All Schlage A-Series Locks come standard with Square Corner 2-3/8" Backset Latch (Spring Latch 11-068; Deadlatch 11-085) and Square Corner Strike (10-001). If you require 2-3/4" Backset (Spring Latch 11-111; Deadlatch 11-091) please order from our Latches Section. 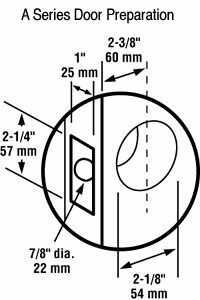 If you require Round Corner Strikes (10-004) please order from our Door Strikes Section. Door Range: 1-3/8" - 1-7/8" (35mm - 48mm). Latch: 1" x 2-1/4", Square Corner Faceplate, 7/8" housing diameter, 1/2" throw. Strike: 1-1/8" x 2-3/4", Square Corner, T-Strike, Box (10-001). Backset: Standard 2-3/8" Backset (Spring Latch 11-068; Deadlatch 11-085). Certification: ANSI/BHMA Certified A156.2-2011, Series 4000, Grade 2, UL Listed for 3-hour fire door. Special Order Information: For pricing on any function or finish of the Schlage Commerical A-Series Levers not found on this page please contact Taylor Security direct via e-mail (sales@taylorsecurity.com) or call us toll-free at 1-800-676-7670. - Passage (Hall & Closet): Both levers always unlocked. - Privacy (Bedroom & Bathroom): Pushbutton Locking. Can be opened from outside with small circular tool. Turning inside lever releases button. - Half Dummy (Dummy Trim): Single-sided surface-mounted Dummy Trim for one side of door. Used for door pull or as matching inactive trim. Special Order Information: For pricing on any function or finish of the Schlage Commercial A-Series Levers not found on this page please contact Taylor Security direct via e-mail (sales@taylorsecurity.com) or call us toll-free at 1-800-676-7670.